I haven't written lately because I guess working full-time and taking care of babies the other full time takes up the whole time! But my arms have been much more free lately because Marc has started to walk like a drunken Frankenstein and he is thrilled with that as well. Gabby was very difficult for a while, which is the nature of her age but she has gotten about 15% better. It is humorous and wonderful to hear the ideas and comprehension that comes out of her. And just as amazing and insatiably engrossing is hearing Marc speak - he is just a burst of vocabulary! My job is going well - now that I have been there for about 4 months, I am able to do my work with more ease. I have a very heightened compassion for many of these older patients and for that, I have a purpose in what I do stretching far beyond nutrition. 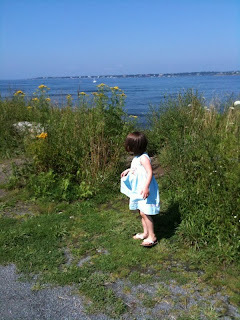 We recently went away for the weekend to Newport, Rhode Island which is wrought with memories for Tom and I. It was great family time, but awful traffic. The one thing I am remembering about this trip that is standing out as different from any other is that I had a potty trained toddler. I had to cringe every time my clean little girl would grip the nasty dirty toilet bowl in a public bathroom as if there was no problem. I can't even bear to put my own hands on a clean toilet bowl but my kid is doing it with dirtiest of them. I just try to get through the yucky moments and scrub the heck out of her hands. I guess Tom didn't realize the exact logistics that go on when taking her to go pee pee in these gross bathrooms but I had to vent after one lovely experience. MAN that is gross! You have to let her pee though, either that or I get into an all out arguement in a 3 x 3 stall with about 20 people waiting to have their chance at the germ thrown. So I told Tom this story prefaced by my understanding that there are toddler gloves that are made to be put on when going into public bathrooms for scenarios just like this. He said that's disgusting and she is going to get Hepatitis. I guess I just have to wallow in my ignorance and assume that she will not get any yucky diseases...and go get the gloves so I can foster her new found obsessive compulsive disorder.